Silver denarius, 18mm, 3.60gm, issued AD 203. Rome mint. 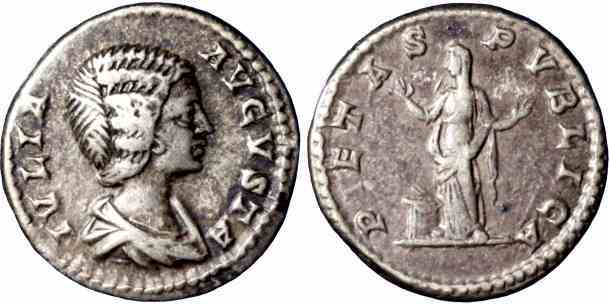 Obv: IVLIA AVGVSTA, Bare-headed, draped bust facing right. Rev: PIETAS PVBLICA, Pietas standing left both hands raised, altar at feet. References: Sear 6601, RIC 574, RSC 156.